I found this very strange creature during the summer of 2013 when I was out exploring the wild expanses of the Fifteen Acres in the park. It was a beautiful sunny morning after a night of heavy rainfall in the park and I always like to take a stroll through the long grass and forested areas on days like this. I could see this tree stump off in the distance and at first assumed somebody had actually planted a large stick into the rotting core of the tree. As I got closer it became apparent that what I was looking at was actually a brand new tree growing up through the centre of the original tree stump. I’m guessing the tree was either cut down because it was dead or maybe it had become unsafe in some way. Little did the park maintenance staff know that this tree had no plans of going away too easily. I’ve no idea if the new growth is part of the original tree or some opportunistic stranger who found a nice damp place to propagate, nor do I have any idea how it managed to pick such an unusual spot to start it’s new life. I’ll be keeping my eye on it over the next few years to see how it manages to expand in such a small space, I wonder will it slowly crack the original trunk beneath it so expect some follow on photographs at some stage. Anybody out there know what kind of tree this is then please let me know, I’d love to know if you can identify it for me. The photo was shot on Kodak Tri-x 120mm film using a Bronica medium format camera. The print was made on Kentmere paper by myself in the darkroom. You can either pay directly via Paypal or with your own credit card. Don’t worry if you don’t have a Paypal account, you don’t actually need one, you simply click on the button and enter you card details to pay via Paypal. 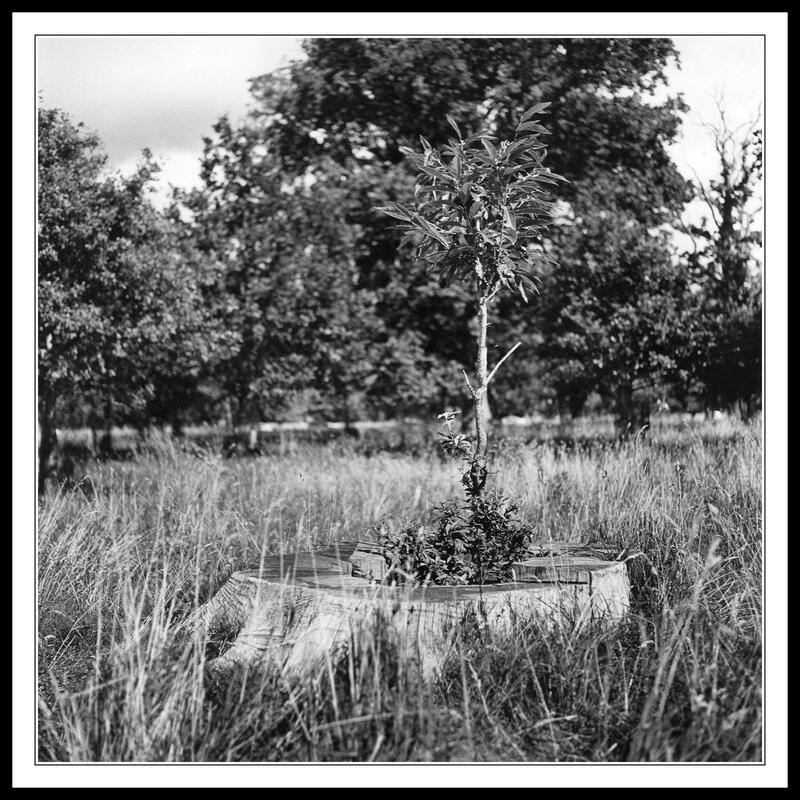 This entry was posted in Black and White Photography, Film Photography, Phoenix Park and tagged Black and White Photography, bronica medium format, Fifteen Acres, Film Photography, Kodak Tri-x, medium format camera, New Life, Tree Stump. Bookmark the permalink.